Here you will find Written Directions and a Map Link to our Charter Vessel. Take Rt. 2 or I-93 to Rt. 16 East. Follow Rt. 16 East until you get to Rt. 145 (approx. 6 miles from end of Rt. 2 and approx. 4 miles from the Rt. 16 Revere exit off I-93). After following Rt. 16 from one of these exits, look for a large apartment complex on the left (585 Revere Beach Parkway). Take that NEXT right on bridge (that’s Rt. 145) you will be in Revere. Follow that road for about one mile, you will pass Suffolk Downs race track on right. That road will bring you to the ocean. When you get to the water take a right along the beach, and follow that road for aproximately 1.5 miles you will see the ocean and five large rock piles (jetties) on your left, follow that road to the end. Take a right on Beacon Street and at end take a left, and then your first possible right into driveway DIRECTLY ACROSS FROM 586 SHIRLEY ST. 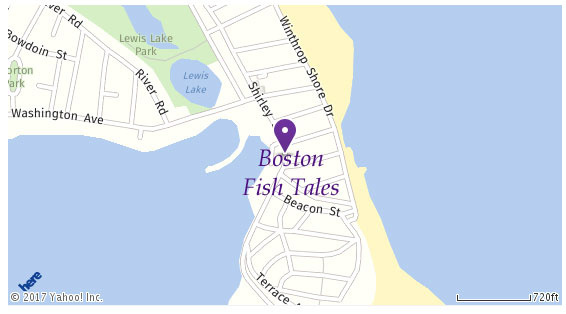 The name of the marina is Crystal Cove Marina, 529 Shirley Street, Winthrop MA - On Rice’s Wharf. From South through Ted Williams Tunnel: when you exit the tunnel keep to left, that will be Route 1A North. After you pass the airport entrance take the first exit on right - Route 145 Winthrop. At end of ramp continue straight, (that will be Bennington Street, East Boston) go approximately 2 miles you will come to large intersection, take that right on Saratoga Street (Route 145) follow aproximately 1/2 half mile you will see water on right and go over small bridge, take next right (Route 145) follow that road aproximately 2 miles. At end take right. Crystal Cove Marina 100 yards on right. 529 Shirley Street, Winthrop. Go past marina main entrance aproximately 100 yards and and take that right into driveway on Rice's Wharf..